As part of the reading and literature plan that I had for my boys, I had them keep a Reading Record. This particular form is from the Spelling Power book but you could easily make one up or use a notebooking page from a set you have. What made this one work for my boys when they were younger is the simplicity of it and the way we customized it by adding star stickers to show how much they liked the book. They used a scale of 1 to 5 (five was the highest). This was simple and easy to get them do at the end of each week. They would share these records with me at the end of the week and I would have them explain why they gave a book the number of stars they recorded. Another tip: I didn’t always correct every spelling mistake and punctuation error I found in this kind of writing. I made a note to cover the misspelled words in the weeks to come and to address the other errors during our more formal writing and grammar time. I learned to pick my battles. Question from Reader: I read your review of IEW on both The Curriculum Choice and your personal blog. I’m thinking of purchasing IEW for our homeschooling next year and was hoping I could ask you a question on the program. It’s a pricey program, so I’m more hesitant to jump the gun and buy it without thoroughly researching it. Is it worth the price? Writing has not always been easy for me. I can clearly remember the days of my growing up years when my teacher would assign the inevitable “What I Did Over Summer Vacation” essay. I would sit with pencil poised over the blank paper but the words wouldn’t come freely. My mind would go blank. My stomach would start to hurt. I would tell myself to just write something on the paper. So it would go…I would put something down and eventually feel like a failure because it was boring and lifeless. Fast forward to when I started to homeschool my own children. At that time there were very few writing programs for homeschoolers and I tried to put my own plan together. My children would receive an assignment and I would see in their eyes the same look I must have had when I was a young writer with nothing to say. I knew that there must be a better way than the way I had been taught to write. Where was it? Unfortunately, it wasn’t until years later that I found the answer. I had heard of IEW but had been put off by the price tag. I wasn’t willing to invest the money in a program that I wasn’t convinced was necessary or would work with my boys. That was until I went to a convention and actually heard Andrew Pudewa speak. IEW is different than other writing programs because it gives your child the tools needed to write along with giving them something to write about. Children at first do not pull the ideas or facts for their writing pieces from thin air. They are given something to write about whether it is a retelling of a story, a mini-research report, or a super essay. They can concentrate on the writing skills. Writing at first is done using models and a framework. As the child gains confidence, they can begin to put their voice into their writing. This is done with their particular style, vocabulary, and point of view. So if you see that look in your child’s eyes, look into the Institute for Excellence in Writing’s program. I urge you to look past the price tag and really think about what a gift it is to give your children…the gift of confidence in their writing. You can read my thorough review of the Teaching Writing: Structure and Style program over on The Curriculum Choice. Do you struggle with teaching writing? Let’s face it. Homeschooling for high school is so very different than any other phase, especially when you get into the junior and senior years where your child is very capable of handling so many things. 1. They read well and you can offer just about any book for them to read without worrying that it is going to be above their reading ability. 2. They prefer to do most of their work on their own as long as you are available to help them if needed or to talk about something that interests them. 3. They can use just about any device you have with skill: computer, word processing program, scanner, copier, and the internet. 4. They know where to go to research an answer to a question and at some point can even drive themselves to the library to pick up additional books and resources. 5. They reverse roles and start to teach you things and you become fellow learners. I wouldn’t miss this part of our homeschooling experience for the world. Mr. B has been preparing for the CHSPE (California High School Proficiency Exam) which he will take tomorrow morning. He is hoping to pass the test even though he will still remain in our homeschool. Passing this test is the equivalent of a high school diploma and will allow him a little freedom in various areas (getting a part time job, community college courses, etc.) My other two sons took it when they were in high school and it is a great practice. I loathe standardized testing but they are a real part of every adult experience whether it is for a job application or as part of further education. I had the joy to read two essays Mr. B wrote and polished, one on Benjamin Franklin as part of his IEW American Literature course and another on Nazi propaganda which was fascinating and enlightening. Can I just say thank you to Andrew Pudewa and the IEW materials for allowing me to teach my children to write and to become accomplished at expressing themselves in words on paper? Thank you! I found a fabulous resource for high school government to supplement our Thinkwell course. I was actually going to put together a set of notebooking pages for Mr. B to follow the presidential campaigns and elections over the next year. 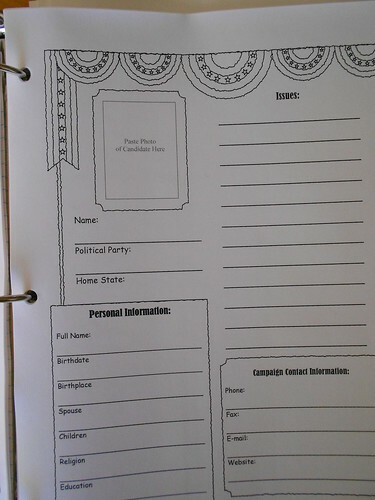 I found a set already done and although they were made for the 2008 elections, there are blank versions of each of the pages so Mr. B can fill them for the 2012 elections. What a great find! I am so grateful for the internet and the materials that so many homeschooling moms share with the internet community. Here is the website: Mom and Pop Homeschool. There are three sets to download for free and we have saved them to use when the need arises. This website has lots of relevant links to use in your study of the election process and would be a great supplement to your government study. This week Mr. B continued his listening with Bela Bartok, choosing to listen to Romanian Dances which were much easier to listen to and we actually would say that we enjoyed them. Don’t forget to link up to share your composer study. We are off to enjoy a nice Friday. This has been the week to visit and encourage friends….taking flowers, little notes, and now today a DVD to share with someone. Sometimes I forget to include time for these service related activities that build us up as much as they do the person we are actually trying to encourage. It is a gorgeous fall day and we intend to enjoy it! Don’t forget to write your own Wrap-Up post and share over at Kris’ blog by clicking the link at the top of this post!